This time, I had a customer running device-based RADIUS (802.1x) authentication on their wired network. All options in the configuration profile appeared to be setup correctly and the device obtained its Active Directory (AD) certificate correctly and without issue. However the device just sat there on “Authenticating…” without any change. It appears that the Mac client is presenting the certificate to the RADIUS server, as requested, but the request is being accepted as a ‘user-authentication’ request, rather than a ‘device-authentication’ request. Due to this, the Cisco unit attempts to look up the authentication request against AD users and not computers, resulting in the “user” not being found. Now Ben had a great work around of setting the NPS server to modify the incoming authentication request, to make it acceptable to the RADIUS server. This was not something the customer’s Cisco ACS unit could do. Additionally, his issue was only seen by Ben on Mac OS X 10.8, where-as I was having issues with OS X 10.11.4. Regardless, I worked with the customer’s AD team with the various options for certificate templates, with no resolution in sight (*sad panda*). After some more digging on the client side, I found that if I kept cancelling and reconnecting the 802.1x connection in the “Network” System Preferences, I would eventually get prompted to select a device certificate and username for the connection. If I specified the AD certificate (typically seen as the fully-qualified domain name of the client device), then entered “host/[fully-qualified domain name of the client device]” for the ‘username’ it would connect! The RADIUS authenticated connection was not auto-connected after login, even when logging in as the same user account. As is the case with the newer OSes, 802.1x configurations can only be deployed in a configuration profile. This configuration profile does have a space for a username. What if I manually specify “host/[FQDN]” for my test Mac, before deploying the profile? Success! It works exactly as it should, with no end user configuration, and with automatic reconnection at both the login window and afterwards. The next problem was how to make this dynamic enough that I can deploy the same profile out to all Mac devices and have it work? Well, Configuration Profile files are simply xml files, files which can be manipulated with a script! 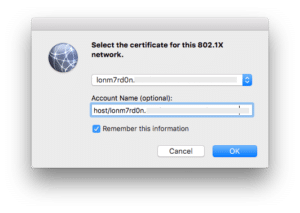 Pull the local hostname and figure out it’s fully-qualified hostname. Install the profile locally into the device. As always, the script I’ve created can be found on our GitHub here. Lines 120-126 – Delete the now used ‘on-disk’ profile from the local OS. 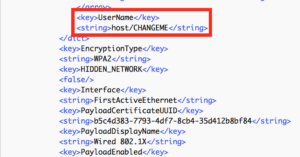 The ‘username’ field must be “host/CHANGEME” in the EAP payload. 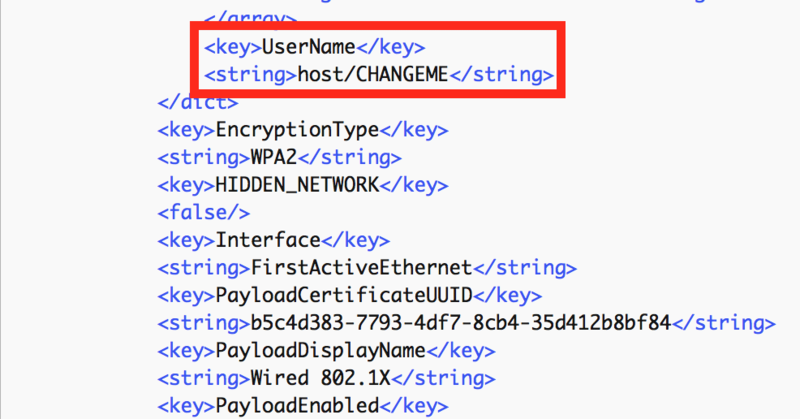 “CHANGEME” will be replaced with the fully-qualified hostname. The profile has to be ‘unsigned’. I’ve not tested this with a signed profile but I imagine, as the script will edit the profile after its has been signed and before its installed, it will not work. If you produce a signed profile normally (certainly if you’re using Casper, and optionally if your using Profile Manager), then you can use our ‘de-sign config profile’ automator service available from here. Now to bring this all together! Build your normal RADIUS / 802.1x Ethernet profile in your MDM of choice. Don’t forget to add your certificates (both AD and server) and the “host/CHANGEME” username. Export / download this, and (if required) de-sign it as detailed above. Add the script (mentioned above and linked again here) as a post-flight script to the package. Deploy the package to your required devices using your deployment tool of choice. As with anything, there are always a few things to look out for! As this workaround requires making on-device changes to the profile, they can’t be deployed using an MDM solution. This does mean that users could remove the profile and no longer be able to authenticate against your RADIUS servers. Workarounds could simply be blocking access to the ‘Profiles’ System Preference, or as elaborate as only allowing non-RADIUS-authenticated devices to communicate with your management solution, and having checks in place to automatically reinstall the profile as required. There you go, hopefully that’ll give other Mac Admins a helping hand with trying to sort out RADIUS for their Mac devices. As always, if you have any questions, queries or comments, let us know below and I’ll try to respond to and delve into as many as I can. 8 Replies to "Workaround for wired device-authentication against Cisco RADIUS solutions"
I must say we don’t have to fill in the “host/” part, only the computer account. Is the host the same as the domain? The ‘host/’ is literally that, “host/”. It’s not a placeholder or something to be substituted. YES! (sorry for the capitals, just so happy I found this). It seems to be possible to use variables in profile manager. So, what you do is: Create the profile as you described. But instead of using host/CHANGEME, you enter %AD_ComputerID%. And that’s it! It will automatically fetch the computer ID and use this for authentication. I’ve actually just completed a blog on payload variables for Jamf Pro (formally Casper) and Profile Manager. Just a minor correction, I’d need to use “host/%AD_ComputerID%” because the ‘Host\’ was the bit I needed ???? Hi Darren can you help us understand and answer the following questions? What RADIUS attributes are best suited for MAC clients to check whether a user is already domain authenticated. – Is there a method on MACs to force the machine to send its hostname in the RADIUS packet when performing PEAP-MCHAPv2 and EAP-TLS. Is there a best practice or Apple proprietary way to do this? Thanks for your message, but I’m afraid I don’t quite understand what you’re asking. As far as methods to test if a user is already authenticated for RADIUS, that will depend on your RAIDUS / Network configuration. At the client I worked with, if the client couldn’t authenticate to RADIUS, it wouldn’t get an IP address so that was quite simple! For Mac RADIUS, you can’t alter the packets that are sent without some sort of 3rd party interception tool. Additionally, to my knowledge, once a device is authenticated, you should be good. If this doesn’t answer your questions, I’d suggest you take a step back and explain what you’re actually trying to do or what issues you are having. Also, I’d strongly suggest joining the Mac Admins Slack (Free!) which is easier to work through these types of questions. Plus there currently are 11,237 others who can help!